Experience more of what Montreal has to offer with a car rental. VroomVroomVroom lets you compare deals from Montreal's major rental car companies including Alamo, Enterprise, Budget, Dollar, Hertz and Avis. All you need is fill in the search form above with full information to find the right rented vehicle you want and save. Montreal brings a bit of European charm to eastern Canada. It is the biggest city in Quebec, home to an estimated 1.75 million residents. The French-speaking region is located on the Island of Montreal, close by other municipalities such as Dollard Des Ormeau, Dorval and Kirkland. The city's name comes from the large hill in the middle of the city, now referred to as "Mont Real". Why rent a car in Montreal with VroomVroomVroom? Convenience: As the largest city in Quebec, Montreal has many depots from which you can choose to collect your rental car. With more than thirty addresses, you will be able to find a location convenient for you in the city area, and directly from Montreal-Trudeau International Airport. More car rental options: We offer a wide selection of cars from different suppliers. We can provide you with a car that will meet your needs, whether it is a compact, full-size, SUV or a minivan. Trusted since 2001: We are the experts in rental cars. If you need help with your booking, feel free to contact us on phone, email or live chat. You can also reach out to us on Facebook and Twitter. Montreal experiences warm summers and cold winters accompanied by snowfall. The summer months are a popular time to visit the region, and hotels will be experiencing higher occupancy so be sure to book in advance. Consider visiting during spring or fall to take advantage of lower rates. In June, visitors can see Les FrancoFolies de Montreal, a French-language music festival held in downtown Montreal. If you are in the city in July, be sure to catch the Just For Laughs comedy festival. See stand-up performances in huge venues, and attend special outdoor events. If you are planning to explore Montreal and the wider Quebec region it is a good idea to check the traffic and road situations to find the best route. Many of the road signs in the area are in French, with major roads all numbered to help you find your way. The A30 Express in Montreal is a toll road. Visa, Mastercard and cash payments are all accepted at the booths. Be mindful of the speed limits, which are measured in kilometres in Canada. Montreal is a vibrant Canadian city that offers many interesting and exciting attractions. With the city sector called "Old Montreal", you can even step back in time and wander through some of the marvelous structures and sights from the past. Of course, a car rental will help you travel throughout the city with ease. Check out our list of things that you must see and do while you are out there exploring the city. 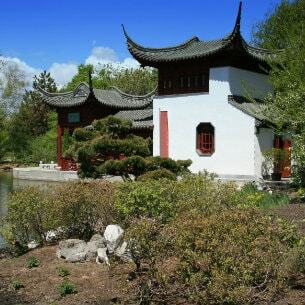 The Montreal Botanical Garden can be found near Olympic Park. Drive your Montreal car rental here and visit over 20 thousand kinds of plants in 31 special gardens. You can stroll through the biggest Chinese garden located anywhere outside Asia, or inspect the wonderful Japanese garden, which features an amazing bonsai collection and its own tea room! In November and December, the Montreal Botanical Garden holds its "Insect Tasting" at its Insectarium! The Notre Dame Basilica is located in Old Montreal. This landmark offers a firsthand look into the beautiful architectural design of James O'Donnell, who created the Notre Dame Basilica in 1824. You're sure to be awed by it! There's a small admission fee, which includes a 20-minute guided tour. You can leave your reliable car rental in Montreal parked and enjoy a fascinating history lesson. Guided tours of Old Montreal can either be enjoyed with a tour guide or by yourself. Swap the rental car for a horse drawn carriage for the afternoon and really get to know the Old Montreal! Cirque du Soleil or Circus of the Sun is a Canadian entertainment company of circus art. It is based in Montreal and since its founding, in 1984, it gained an immense popularity in the whole world. Guy Laliberte and Daniel Gauthier are two former street artists that founded this company in order to offer amazing performances to the public. The tickets for the performances of Cirque du Soleil are usually sold out in a matter of hours, especially in Montreal. Montreal World Film Festival or Le Festival des Films du Monde is a tradition that began in 1977 in Montreal, Canada and is one of the oldest events of this kind in North America. It is held each year in late August and features approximately 350 movies. The competition is ferocious as many films awarded at this festival gain popularity and audience. Ateliers & Saveurs is the right place to learn first-hand about Canadian and international cuisine by cooking and tasting. Stop your car rental and register for one of their fun and social cooking classes to prepare exquisite meals and delicious cocktails. They also offer wine-tasting classes. Ateliers & Saveurs is a culinary experience you will truly enjoy! Budget Cn Montreal - 895 De La Gauchetiere Ouest, Montreal, . Budget Complex Desjardins - 5 Complexe Desjardins Cp 459, Debarcadere Saint Urbain, Montreal, . Budget Hotel 10 Montreal - 2112 Blvd St Laurent, Hotel 10, Montreal, . Budget Montreal - 5185 Avenue Papineau, Montreal, .